This afternoon, the Bears formally announced the signing of third-round defensive lineman Jonathan Bullard. With Bullard under contract, the Bears have now signed their entire 2016 draft class. Bullard, who came out of the University of Florida, racked up 12 sacks and 33.5 tackles for a loss during his time in college. Bullard moved all around the defensive line for the Gators, but the Bears have indicated that they’ll use him as a bookend. Heading into the draft, Bullard had widespread interest from teams and, according to one report, he was in consideration for at least one first-round team. The Bears did not have to draft Bullard in the first round to snag him, however. Instead, they moved up from No. 11 overall to No. 9 to select Georgia edge rusher Leonard Floyd. The 6-foot-4, 231-pounder was a dominant performer during his three-year tenure at Georgia, where he played both outside linebacker and defensive end, racking up 17 sacks and 26.5 tackles for loss. The thought around the league is that the Chargers are going with Notre Dame tackle Ronnie Stanley or Oregon defensive end DeForest Buckner at No. 3, Schrager tweets. Schrager personally believes that San Diego will go with Buckner. Our own Dallas Robinson projects that the Bolts will take Buckner at No. 3. Schrager hears (link) that 25-30 is the sweet spot for someone to trade into the first round and grab a quarterback. That could be the range for Paxton Lynch or Connor Cook. The Cowboys “are split” on Jalen Ramsey and Ezekiel Elliott at No. 4 (link), but Schrager believes that they will take Ramsey. Leonard Floyd could be a real possibility for the Jaguars at No. 5, but if he slips, he probably won’t slip past the Bears at No. 11, Schrager tweets. The Dolphins are high on Elliott if he goes past the Cowboys at No. 4, but the cost could be prohibitive (link). Miami is currently slated to pick at No. 13. Despite a relative lack of hype, Schrager (link) hears that West Virginia safety Karl Joseph, Florida defensive lineman Jonathan Bullard, and Texas A&M offensive lineman Germain Ifedi could go in the first round tonight. A recent report also indicated that Joseph is still likely to go in the first round despite a torn ACL. Joseph will likely have to miss a good chunk of the 2016 season as he rehabs from his injury. Ole Miss defensive lineman Robert Nkemdiche is meeting with the Broncos today in Denver, Ian Rapoport of NFL.com tweets. After his meeting there, he’s off to the Cardinals for a visit. Teams are reportedly fearful of Nkemdiche’s off-the-field issues, but his talent should still keep him pretty high up on boards around the league. Cal running back Daniel Lasco has received invites from the Texans, Raiders, and 49ers, Aaron Wilson of The Houston Chronicle tweets. Lasco has also had private workouts with the Patriots and Eagles and he’ll take part in the Texans’ local pro day since he’s from Houston (via Matt Barrows of The Sacramento Bee on Twitter). Lasco turned heads with his performance in 2014 but he was held back by a hip injury in 2015. Former LSU corner Rashard Robinson is generating a ton of interest, per Rand Getlin of NFL.com (on Twitter). Robinson visited the Broncos recently and the Jets and Seahawks are next on his docket. Robinson sat out 2015 after being suspended indefinitely by coach Les Miles. With no hope of getting back on the field for LSU in 2016, Robinson declared early for the draft. Houston linebacker Elandon Roberts has (or has had) workouts with the Texans and Steelers, Getlin tweets. He also has a visit lined up with the Cardinals. Roberts led the FBS with 88 solo tackles last year. 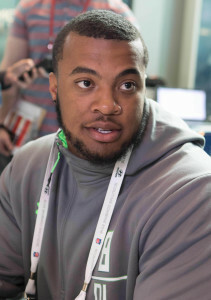 Florida defensive lineman Jonathan Bullard has visits and/or workouts on the books with the Lions, Jets, Titans, Seahawks, Raiders, Falcons, and Patriots, Getlin tweets. Here’s the latest from the next wave of prospects set to enter the league, starting with a dual-threat quarterback. Dak Prescott will work out for the Broncos and other teams in early April, according to Chase Goodbread of NFL.com. The former Mississippi State standout rushed for more than 800 yards in both his sophomore and junior campaigns. Cowboys quarterbacks coach Wade Wilson and Cardinals QBs boss Freddie Kitchens trekked to Starkville, Miss., to work out Prescott this week as well. Following his Broncos workout, Prescott will visit the Bills and Eagles, Goodbread reports. From one current dual-threat quarterback to a former standout hybrid signal-caller, Braxton Miller worked out for the Texans today, Bleacher Report’s Matt Miller tweets. The former Ohio State standout and two-time Big Ten offensive player of the year at quarterback is working out as a slot receiver after being supplanted last season under center. The Browns, Buccaneeers, Lions and Saints are gracing Ohio State safety Vonn Bell‘s itinerary for workouts and/or meetings, Rand Getlin of NFL.com tweets. The early-entry Buckeyes safety already met with Tennessee. Clemson safety Jayron Kearse will has summits and/or workouts with the Panthers, Saints and Titans on his spring docket, Getlin tweets. The 6-foot-5 safety registered 6.5 tackles for loss as a junior last season. The Titans, Seahawks, Raiders and Falcons appear on Florida defensive lineman Jonathan Bullard‘s schedule, Getlin reports (on Twitter). Bullard’s 6.5 sacks as a senior last season tied for a Gators-best mark, and his 18 tackles for loss were easily the best on the team. Minnesota linebacker De’Vondre Campbell will meet with the Cardinals, Falcons, Chiefs and Vikings soon, Goodbread tweets. The Texans and Patriots ventured to Minneapolis recently to look at some of the Gophers’ NFL prospects, Ryan Burns of scout.com tweets. The Texans’ contingent looked at the Gophers’ prospects last week, with the Patriots’ bevy of personnel making the trip earlier this week, per Burns. Cornerbacks Eric Murray and Briean Boddy-Calhoun are also among Minnesota’s top draft-eligible players. According to Darren Wolfson of KTSP (on Twitter), the teams were scouting Murry, Boddy-Calhoun and Campbell. Arizona safety William Parks will visit the Seahawks and Browns after showing well in his workout, Tony Pauline of Draftinsider.net reports. Wildcats offensive lineman Lene Maiava has visits scheduled with the Chargers and Seahawks, Pauline reports. Tennessee wide receiver Marquez North worked out for the Cowboys, Aaron Wilson of the Houston Chronicle/National Football Post reports. North tore his labrum in 2014 and saw injuries limit him to six catches last season but decided to enter the draft as a junior anyway. While Jaguars GM Dave Caldwell appears confident that the team has improved its pass rush this offseason, it sounds like head coach Gus Bradley wouldn’t mind adding another pass rusher or two, as Ryan O’Halloran of the Florida Times-Union details. Caldwell pointed to Malik Jackson, Dante Fowler Jr., and Sen’Derrick Marks as three players capable of getting after the quarterback that essentially weren’t a part of last year’s team (in some cases due to injuries). Bradley, meanwhile, suggests that Jacksonville will keep an eye on pass rushers during and after the draft. In another O’Halloran piece, the Times-Union scribe notes that the Jaguars appear to have offered punter Bryan Anger a multiyear contract before signing Brad Nortman. Anger ultimately signed a one-year deal with Tampa Bay. The Panthers met with and worked out Alabama defensive tackle Jarran Reed this week, and will have him in for a visit next month, according to Joseph Person of the Charlotte Observer (Twitter links). In his latest mock draft, ESPN’s Todd McShay has Reed coming off the board at No. 19 to Buffalo, 11 spots before the Panthers’ first pick. Ohio State linebacker Darron Lee is working out for the Falcons today, telling Vaughn McClure of ESPN.com that it’s the first workout on his schedule. “From what they told me at the combine, they need a lot of speed on the defensive side of the ball,” Lee said. Interestingly, McShay’s mock draft from today has Atlanta nabbing Lee with the 17th overall pick. The Titans are taking a close look at a couple University of Florida prospects, according to Terry McCormick of TitanInsider.com, who writes that the team has worked out and met with inside linebacker Antonio Morrison and defensive lineman Jonathan Bullard. Per McCormick, Tennessee has also put Northern Iowa cornerback Deiondre’ Hall through a workout. Before his pro day, Campbell defensive tackle Greg Milhouse had a dinner meeting with the Saints, a source tells Aaron Wilson of the Houston Chronicle (Twitter link). Head coach Sean Payton said this week that adding to the defensive line is a top priority for New Orleans heading into the draft. Ever since the Jets placed the franchise tag on Muhammad Wilkerson – and even before that – the defensive lineman has been viewed as a potential trade candidate. With Sheldon Richardson and Leonard Williams in line for extensions of their own within the next few years, the Jets will have to make a decision on which defensive linemen they want to keep long-term. According to Tony Pauline at WalterFootball.com, the Jets appear to be at least exploring potential trade options for Wilkerson. Pauline says that “the word coming from Florida pro day” is that the Jets are shopping Wilkerson. However, Pauline cautions that whether or not the team will actually be able to find a suitable deal is another thing altogether. Wilkerson, 26, enjoyed his best season as a pro in 2015, racking up a career-high 12 sacks and forcing three fumbles, to go along with 64 tackles. Arguably the best defensive player for the Jets last season, Wilkerson also earned his first Pro Bowl berth. However, he broke his leg during New York’s regular-season finale, and while that injury isn’t expected to sideline him at all next season, it may give potential suitors pause. 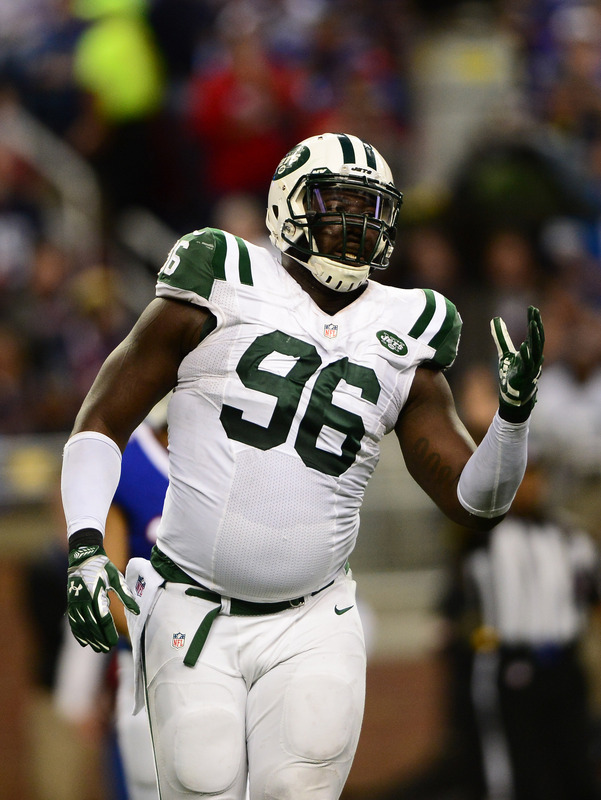 Additionally, having been franchised, Wilkerson is currently projected to earn a $15.701MM base salary in 2016. Any team trading for Wilkerson would presumably want to extend him beyond ’16, but that pricey franchise salary provides a guideline for what sort of money he’d be seeking on a long-term deal — it would be a very expensive proposition for a club to pay him that sort of money in addition to giving up trade assets for him. The Jets will likely say they want Wilkerson in the mix for 2016 and beyond, and that could still end up happening, but as I noted late last night, comments from members of the organization hint that a trade remains a possibility. Owner Woody Johnson said on Monday that he wouldn’t be disappointed to see Wilkerson remain with the Jets for 2016, which isn’t exactly a ringing endorsement for locking him up to a multiyear extension. According to Pauline, the Jets would consider Gators defensive lineman Jonathan Bullard a potential draft-day target if they end up trading Wilkerson.